You can stack at DG...just in case you didn't know that...they have stacks of STORE coupons at the entrance...pick up a few and stack them with your manufacturer coupons. Now let me make it clear I went to Dollar General last night on 72/Albright/Main in front of BILO and the manager wasn't aware of the stacking policy. I went through my emails and have confirmed from July that confirmed that they do. So with that said...no Internet Coupons, but newspaper & magazine coupons are just fine!!! 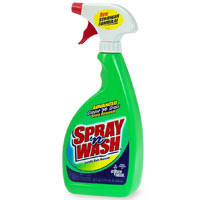 Saw the Spray N Wash for $2.75 minus the store coupon .75 = $2 minus your manufacturer $1.25 coupon makes it .75cents and it is the larger bottle. I will be posting the policy for you to print and keep with you.